Thanks to Ace for the review copy of Holy Sister in exchange for an honest review. 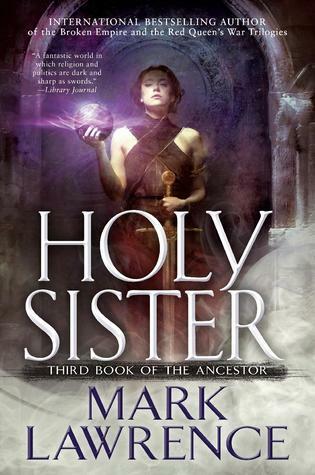 Holy Sister is the bittersweet flourish to the masterfully-written Book of the Ancestor series from Mark Lawrence. This book is both the ending you dreamed of and an ending that makes you want to cover your eyes. Holy Sister is a nail-biting epic from the first page to the last. From the east and the west come armies of the Scithrowl and the Durns, each armed to the teeth and ready to savage the remnants of the empire. As the ice pushes ever-inward, Nona and her sisters at Sweet Mercy are set adrift in the tides of war. As humanity comes to a head, the world at once looks very large and very small to Nona Grey. Old enemies are out for her blood. New enemies are hungry for power. Even the life she once led at the convent has changed, and she finds herself at the forefront of mounting pressure to protect the ones she loves. She’s not a girl any longer. Old hierarchies can no longer be relied upon, and authority in the Corridor dwindles in the maddening rush to survive the ice. Abeth is a cold world with sharp teeth. If anyone can save it, it’s Nona Grey. The gate to the Shade steps surrendered to a slash of her blades and she emerged to run through the convent where she had grown from a small child into the young woman Abbess Glass had burdened with too much trust. I just love Mark Lawrence’s two-timeline structures. Holy Sister was reminiscent of King of Thorns, leaning heavily on the timelines to foreshadow unique twists, often from chapter to chapter. I loved the payoffs for each of the sisters in Sweet Mercy, especially THAT SCENE with Mistress Path [reasons redacted!]. Suffice it to say, the nuns of Sweet Mercy stand alone in their skill, knowledge, and bravery. Nona is such a joy to read. She has grown so far beyond the girl she was in Red Sister – certainly she’s still a power to contend with, but she’s gained a wisdom that has honed her rage to a fine point. Like Lawrence’s Jorg Ancrath from the Broken Empire series, she’s a character you could throw into any situation and she’d come out on top. I also loved Zole in Holy Sister. The complete and utter foil to Nona, Zole is nearly devoid of any emotion. Their playing off each other in the mountains was a lot of fun to read, and I enjoyed everything beyond that too. Great dynamic. The first few arrows winged around them as the archers sought their range. One came close and Zole snatched it from the air. She reversed it, took two paces forward, and flung the missile back, her arm cracking through the air. A second later an archer among the riders toppled from his saddle. “I didn’t… know we could do that …” Nona said in a small voice. I think the thing I enjoy most about Mark Lawrence’s writing is his mastery of the implicit story. I love teasing out the history of a strange world, and Abeth is unique in that respect. The whole plot of an ancient race of people hanging a mirror in orbit to survive on a cold planet, and to power the artificial moon by “ship-hearts” is such an interesting concept to speculate on. Even the characters’ mention of things like artificial voice-controlled lights, ancient structures with holographic interfaces and voice assistants leads me to internal speculation about the history of the world. And everyone knows that head-canon is the best canon! I suppose that all good writing tries to show you the tip of the iceberg rather than the whole thing. Maybe it’s just that Mark Lawrence’s icebergs are more interesting to me than everyone else’s. Go grab a copy of Holy Sister! Well, at least you agree with Griffin 😊. I should have my review up by Friday.